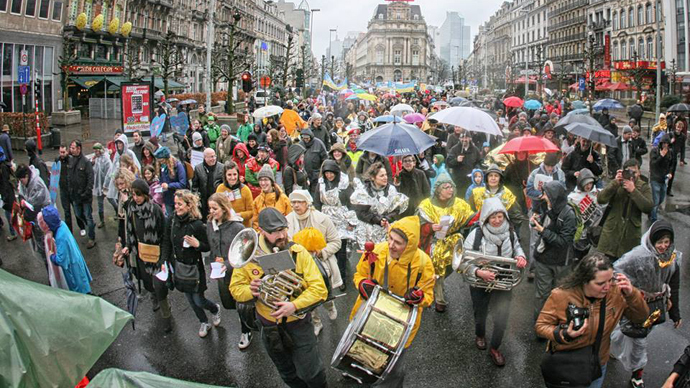 Rainy weather in Brussels did not stop tens of thousands of people from protesting against austerity measures introduced by the new Belgian government. Attendance estimates from police and organizers differed sixfold. The rally saw somewhere between 17,000 and 20,000 people on Sunday, RTFB broadcaster reported, citing police estimates. Meanwhile, march organizers claimed that up to 120,000 people participated. The march was organized by 'Hart boven Hard’ (Heart Over Hard). During the demonstration, activists spoke out against budget cuts and unfair taxation policies. Another protest is scheduled to take place in Brussels on Monday, with local labor unions organizing a wave of strikes. At least 7,000 people are expected to take part.